Professionals with a doctoral degree in reading have specialized knowledge and practical skills in literacy research, leadership, instruction, and assessment. These experts work with diverse groups of learners in various educational contexts. Graduates of literacy doctorate programs work in classroom instruction, school administration, curriculum development, and corporate workforce training. Earning an Ed.D. in reading and literacy can help teachers, educational leaders, and curriculum experts advance in their careers. The Bureau of Labor Statistics (BLS) projects that employment for instructional coordinators will increase 11% between 2016 and 2026, much faster than the national average for all occupations. The BLS also projects that positions for training and development specialists will see similar growth within the same period. These positions are often highly paid: School principals, for example, earn a median annual salary of $92,510. What Are the Best Online Doctorate in Reading and Literacy Programs? Online Doctorate in Reading and Literacy Degree Program Ranking Guidelines: We selected the degree programs based on the quality of program and range of courses provided, as well as school awards, rankings, and reputation. Appalachian State University ranks among The Best Online Doctorate in Reading and Literacy Programs! Based in Boone, North Carolina, ASU offers a doctor of education in educational leadership with a literacy in exceptionalities concentration. This program is offered through a hybrid format. Students pursuing this literacy doctorate take a minimum of 60 credits, split between 36 core education credits, 18 credits of literacy concentration courses, and a six-credit dissertation. The program core covers major topics in education, including educational organizations and technology, writing for the professional educator, and qualitative research methods. Concentration courses allow students to select from a variety of advanced electives, with options such as severe reading disability and literacy instruction for students with challenging behaviors. The concentration component also requires candidates to complete an internship worth 3-6 credits; this year-long practicum allows students to gain hands-on experience working at an approved education agency. However, students must visit campus for some required special internship seminars. ASU is regionally accredited by the Commission on Colleges of the Southern Association of Colleges and Schools. Concordia University - Chicago ranks among The Best Online Doctorate in Reading and Literacy Programs! A private, liberal arts school affiliated with the Lutheran Church-Missouri Synod, Concordia University Chicago offers two online literacy doctorate programs: an Ed.D. and a Ph.D. in leadership with a reading, language, and literacy specialization. Both programs provide a theoretical and practical approach to literacy education, emphasizing strategies rooted in the latest research. Requiring 61-67 credits, these two degrees offer similar curricula that include four major components: core language and literacy courses; foundations, philosophy, and ethics courses; research and statistics courses; and culminating dissertation/final exams. The two tracks differ somewhat in terms of their coursework. For example, Ph.D. candidates must complete a philosophy of scientific knowledge class, while Ed.D. candidates complete coursework in philosophical and theoretical foundations of leadership. The Ph.D. track is also more research-oriented, with candidates taking five research courses. Alternatively, the Ed.D. is more practice-oriented and includes just three research courses. Concordia University Chicago is regionally accredited by the Higher Learning Commission. Indiana University - Bloomington ranks among The Best Online Doctorate in Reading and Literacy Programs! The largest university in Indiana, IU is home to an Ed.D. in literacy, culture, and language education program that features a flexible curriculum intended for working teachers and a cohort format that encourages collaboration and strong peer relationships. The degree's integrative focus also allows candidates to build connections between class learning and their own professional practice. This 60-credit Ed.D. in reading and literacy is available almost entirely online, with no required internship or practicum. However, students must attend at least one academic conference on the IU campus. Organized by the school's literacy, culture, and language education department, conferences take place each spring semester. The degree typically takes about three years to complete, although online learners have up to seven years to fulfill all doctorate requirements. IU is regionally accredited by the Higher Learning Commission. 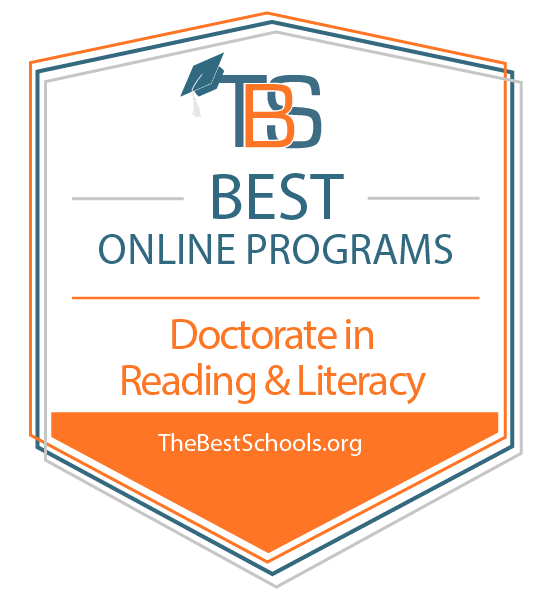 St. John's University ranks among The Best Online Doctorate in Reading and Literacy Programs! A private school based in New York City, St. John's University offers an online Ph.D in literacy that trains candidates to facilitate literacy instruction at all levels of education. Graduates can work with individual students or teachers or whole curriculum and administrative practices. This program emphasizes strategies for serving at-risk learners, with available concentrations in teaching English to speakers of other languages, educational leadership, special education, and a generalized literacy cognate option. This online doctorate in literacy education consists of 42 credits divided between 18 credits of core literacy courses, 15 credits of research core courses, and nine credits of concentration courses. Students also complete a dissertation where they come up with research-based solutions to solve a current literacy problem. By taking courses year-round, candidates can complete the degree in just 2.5 years. St. John's is regionally accredited by the Middle States Association of Colleges and Schools. What Else can I Expect from an Online Doctorate in Reading and Literacy Program? Specific requirements for reading doctorate programs differ between schools. Programs have varying practicum, capstone, dissertation, and endorsement criteria. Still, most students completing an Ed.D. in reading and literacy complete similar coursework. Students who pursue a literacy doctorate online may take courses similar to those listed below. This course provides students with an overview of literacy standards, research, and curricula. Students discuss program models and analyze issues, trends, and teaching practices for diverse educational settings. Students gain experience in curriculum development, implementation, and evaluation. This course is particularly relevant for aspiring instructional coordinators. In this course, students examine the use and implementation of electronic portfolio assessment within K-12 literacy curricula. Students discuss the benefits and applications of both print-based and technology-based assessment approaches. Students seeking careers in school administration or instructional coordination especially benefit from this course. This course explores cognitive, physiological, and psychological theories related to reading and writing skill development. Students discuss and evaluate instructional models for reading, writing, and language development. This course is particularly valuable for aspiring reading specialists. In this course, students examine theories, research, and curricular elements related to the new literacy studies model. Lessons emphasize the importance of contextualized reading education. This course is especially relevant for students who hope to become resource teachers or training and development specialists. This course provides an overview of the historical and philosophical concepts in major literacy research and theory. Students discuss how cognitive, linguistic, and sociocultural factors affect the development of reading and writing processes. This course is particularly beneficial for future reading specialists. A typical doctorate program takes about three years to complete. However, several factors may affect the length of an online doctorate in literacy education, including coursework requirements, research expectations, concentration options, and field experience components. Most literacy doctorate programs require degree seekers to write and defend a research-based dissertation, which may take several months or years. Program structure is an important factor in determining length. Students who pursue an Ed.D. in reading and literacy may choose to enroll in a cohort learning program. Cohort learning requires students to work in groups and submit assignments according to a predetermined timeline. Students who desire a more flexible learning schedule may opt for an individually paced program. These programs allow students to progress through courses as quickly as they would like. Students who decide to earn an Ed.D. in reading and literacy should consider the accreditation status of their prospective school before committing to a program. External accreditation is an indicator of academic rigor and quality. Many students seek doctoral credentials for career advancement purposes, and employers prefer to hire candidates with accredited degrees. It is best for students to enroll in a regionally accredited literacy doctorate program. There are six regional accreditation bodies in the United States, and each oversees schools within a specific region. Regional accreditation is more rigorous and widely respected than national accreditation. Academically-oriented universities and colleges typically maintain regional accreditation. Regionally accredited schools may not accept credits from nationally accredited institutions. National accreditation is common among for-profit and career-based colleges. These schools typically accept transfer credits from both nationally and regionally accredited programs. Two organizations oversee national accreditation: the U.S. Department of Education (ED) and the Council for Higher Education Accreditation (CHEA). The ED distributes federal education funds, collects school data, and enforces education laws. CHEA is an association of U.S. colleges and universities; it supports self-regulation through voluntary accreditation. The ED oversees the funding and legal compliance of educational institutions, while CHEA evaluates their adherence to quality standards. Both organizations maintain online lists of accrediting agencies and accredited schools. Some degrees also hold special programmatic accreditation. Students should seek an Ed.D. in reading and literacy accredited by Council for the Accreditation of Educator Preparation (CAEP). CAEP evaluates and accredits educator preparation programs based on content and pedagogical knowledge; clinical partnerships and practice; and candidate quality, recruitment, and selectivity. Students who complete an online doctorate in literacy education are qualified to work in various fields. Some Ed.D. holders continue their classroom work as reading specialists or resource teachers, while others become elementary, middle, or high school principals. Some graduates apply their specialized knowledge of literacy acquisition and curriculum design to careers as instructional coordinators. Others become trainers for businesses or governments. Reading education professionals who complete an online literacy doctorate program may seek employment in one of the positions listed below. These administrators oversee school operations. They create class schedules, implement curricula, advise students, and evaluate teachers. Principals also assess testing data, discuss student progress with teachers and parents, manage school resources, and determine security protocols. School principals typically possess a graduate degree in education. These professionals help schools develop and implement curricula and teaching standards. They analyze student achievement data, research and suggest educational resources, mentor teachers, and develop procedures for curriculum implementation. They may recommend changes to teaching practices or coordinate educational technology training. Instructional coordinators usually hold a graduate degree. These specialists assess literacy needs, develop and improve reading curricula, and advise teachers on student differentiation and reading education strategies. They typically work in elementary and middle schools, though some work in high schools or childcare centers. Employers may require reading specialists to hold a graduate degree. These educators teach students with physical disabilities and learning difficulties. They maintain educational classroom resources, help teachers implement differentiated curricula, deliver instructional programs, assess student progress, and track assessment data. They may specialize in working with a particular age group. Resource teachers usually have an advanced education degree. These specialists help organizations train employees. They assess training needs, develop and select course materials, deliver instructional programs, and evaluate training effectiveness. They may also perform administrative tasks related to program budgeting, scheduling, and enrollment. Many employers prefer training and development specialists with backgrounds in education. Salaries for literacy education professionals can vary significantly by education level, professional experience, employer type, and geographic location. Some of the top-employing industries are elementary and secondary schools, colleges, educational support services, and state governments. The table below contains BLS salary data for instructional coordinators who work in the highest-paying U.S. states for literacy professionals. On average, the District of Columbia offers instructional coordinators the greatest yearly compensation, at $89,190 annually. Connecticut and California trail closely behind at $85,220 and $80,140 respectively, with New Jersey and Alaska offering wages at $76,780 and $76,730. Some of the lowest-paying states for instructional coordinators are Kansas, Montana, and Florida. Membership in a professional organization can benefit students pursuing an online doctorate in literacy education. Literacy organizations provide opportunities for networking, political advocacy, and continuing education. Other common member benefits include national conferences, local chapters, career resources, awards programs, and research publications. Some organizations also offer discounts on products and services. Students enrolled in reading doctorate programs may seek membership in one of the organizations listed below. ASCD is an international collective of education professionals who value research-based curriculum development and student-centered teaching methodologies. Member benefits include professional training resources, research publications, and product discounts. ALER promotes the continual improvement of instructional practices and teacher preparation programs. Member benefits include award programs, research grants, continuing education, and interest divisions. ILA publishes literacy research, distributes classroom resources, sets teacher education standards, and advocates globally for literacy-focused education funding. Members may volunteer with local networks, apply for grants, and engage in professional development initiatives. Students who choose to complete an online doctorate in literacy education should begin researching financial aid opportunities as early as possible. Universities often offer aid to students with financial need or academic merit. Some schools even maintain program-specific scholarship funds. Students seeking an Ed.D. in reading and literacy may also pursue aid through community programs, professional associations, or private scholarship foundations. Many U.S. students qualify for need-based grants or low-interest loans from the government. Students seeking enrollment in a literacy doctorate program may determine their eligibility for federal financial support by submitting the Free Application for Federal Student Aid. Occasionally, degree-seeking teachers may obtain assistance through their employers. Because highly qualified teachers are great instructional assets, some schools offer partial or full tuition reimbursement to educators completing graduate studies. Some students pursuing an online doctorate in literacy education may choose to participate in the federal Teacher Loan Forgiveness Program, which provides student loan forgiveness to eligible teachers who work in low-income institutions. Similarly, graduates who work in the public sector may enroll in the Public Service Loan Forgiveness Program.